[178 Pages Report] The top 10 connected/smart industries are estimated to grow on the account of decrease in Internet of Things (IoT) hardware cost, need for operational efficiency, and wide adoption of Bring Your Own Device (BYOD) practice. The objective of this study is to define, describe, and forecast the adoption of IoT in different industries and identify the fastest growing industries. It also provides detailed information regarding the major factors (such as drivers and restraints) influencing the growth of the IoT across different industries. Additionally, the study aims at strategically profiling key players and comprehensively analyzing their recent developments and positioning such as mergers & acquisitions, new product developments, and Research & Development (R&D) activities in the market. This research study involved the extensive usage of secondary sources, directories, and databases such as Hoovers, Bloomberg Businessweek, Factiva, and OneSource to identify and collect information useful for this technical, market-oriented, and commercial study of top 10 smart/connected industries market. Along with that, a few other market-related sources such as IEEE and white papers have also been considered while doing extensive secondary research. The primary sources are mainly several industry experts from core and related industries and preferred system developers, service providers, system integrators, resellers, partners, standards, and certification organizations from companies and organizations related to various segments of this industry’s value chain. In-depth interviews were conducted from various primary respondents that include key industry participants, subject matter experts, C-level executives of key market players, and industry consultants, among other experts, to obtain and verify critical qualitative and quantitative information as well as to assess future prospects. The top 10 connected/smart industries ecosystem comprises solution vendors such as ABB Ltd, Cisco Systems, Inc., Intel Corporation, Siemens AG, and Schneider Electric SE; platform providers such as IBM Corporation, PTC, Inc., and Microsoft Corporation; and other solutions and services providers. 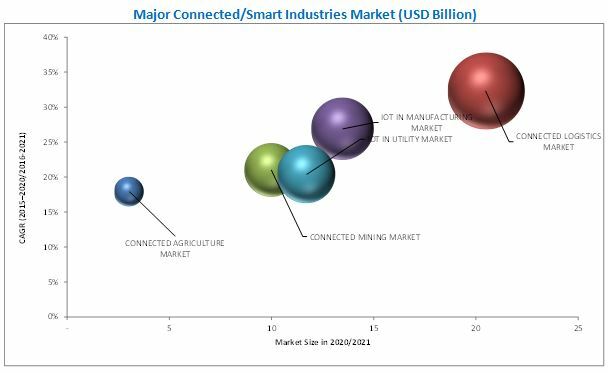 The top 10 connected/smart industries market size is expected to grow at a significant rate during the forecast period. The major growth drivers of the top 10 connected/smart industries market include the emergence of cloud platform, need for enhanced operational efficiency, decreasing cost of industrial hardware and networking component, government regulations, and increasing infrastructural development initiatives such as intelligent transportation, smart cities, and smart highways. The smart transportation market promises huge opportunities during the forecast period. The key trends contributing to this market growth are demographic growth and hyper-urbanization, increase in vehicles leading to road congestion, and reduction of greenhouse gas emission. Government initiatives and emerging partnership models are also fueling the market growth. For example, the U.K. government’s Department of Transport is investing a sum of USD 16 Million in smart ticketing especially among the small and medium-sized bus companies. Moreover, the Governor of Ohio announced a USD 15 Million state investment to embed high-capacity fiber-optic cable and wireless sensors along the auto-industry-rich corridor to permit testing and research of smart transportation technology such as self-driving vehicles. The Internet of Things (IoT) in manufacturing market is expected to grow at a high Compound Annual Growth Rate (CAGR). The manufacturers’ need for operational efficiency has increased the utilization of sensors through enhanced automation and integrated connected technology solutions across the manufacturing process which, in turn, has increased the demand for IoT solutions for various manufacturing applications. Other driving forces include decreasing hardware & connectivity costs and increasing penetration of connected devices. Moreover, the cost benefits of Software-as-a-Service (SaaS) and cloud-based deployment of IoT in manufacturing solutions are also expected to provide a wholesome growth opportunity to the market. The North American region is expected to be the largest revenue generating region for top 10 connected/smart industries solutions and services providers owing to the early adoption of technology and large-scale investments in the region. APAC, on the other hand, is projected to grow at the highest CAGR due to increasing technological adoption and increased technological spending in China, India, Australia, and Singapore. Factors such as centralized infrastructure and low levels of operational efficiency in developing economies are hindering the growth of the top 10 connected/smart industries market. Additionally, lack of skilled workforce also restrains the adoption of smart industries solutions. The report also contains the profiling and competitive landscape of the major technology vendors. Some of the major technology vendors include ABB Group (Switzerland), Cisco Systems, Inc. (U.S.), General Electric (U.S.), IBM Corporation (U.S.), and Intel Corporation (U.S.). The companies are taking different measures such as mergers & acquisitions, partnerships & collaborations, and new product developments to increase their share in the market. These activities have also been tracked and mentioned in the report. 13.7 Parametric Technology Corporation, Inc.